Friends, I am so honored to have one of my (not just on Fridays) Favorites Alise Wright share some words with you guys. You should feel honored, too. Trust me, by the end, you will. I’ve been stalking her blog for awhile now, and am in love. 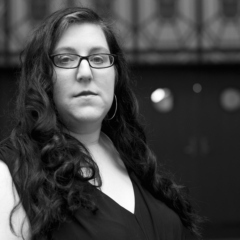 She writes beautifully and openly and if you click over on her site, you’ll fall in love, too. Don’t worry, we can share, I’m not the jealous type. Sometime in early October my daughter told me that she was doing a book report and that she wanted to dress up as the main character. Part of her costume required a rag doll. And since we had six weeks to get this assignment done, naturally I agreed to help her in the construction of said doll. My daughter would give occasional updates, reminding me to buy fabric so we could work on the doll and I would promptly forget them. Then, all of a sudden (except, not really), the report was due in three days and we still had no fabric, no poly-fil, and no doll. I made an emergency trip to A.C. Moore to find some supplies. Bought a small bolt of fabric, a gigantic 32 oz. bag of poly-fil (apparently I thought we might need to make 400 dolls), and some new needle and thread so I could pull this thing together. I’ve got to tell you, I was feeling pretty Martha Stewart-esque about the whole thing. Then we got ready to make the doll. The first thing I realized was that I hadn’t picked out fabric for a dress for the doll. So I was making a naked doll. I next realized that I had no pattern for the doll. So I was going to have to free-hand this. Also, I don’t sew. I love to knit and crochet, but sewing isn’t so much my forte. Here are some pictures of the finished product. Note the uneven shoulders. And the entirely out-of-proportion legs. 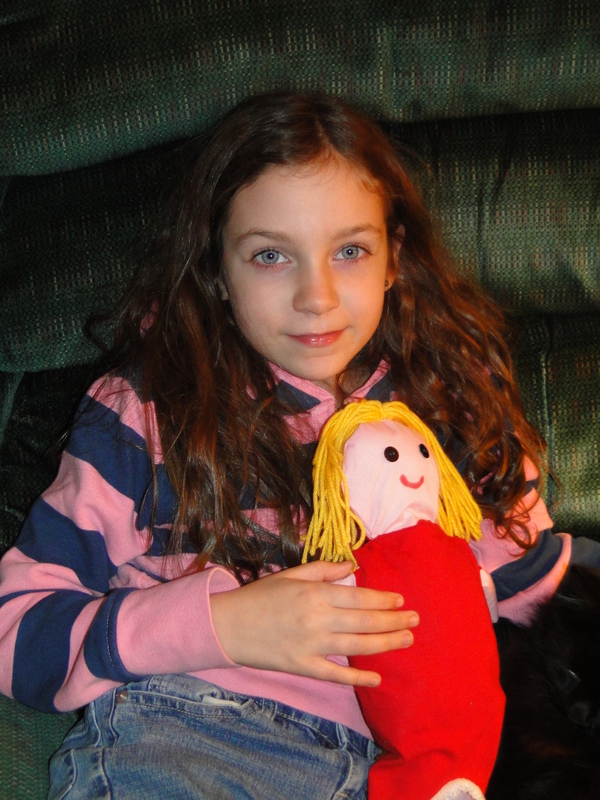 My daughter holding the finished doll. Be sure to observe the bottom-of-a-pair-of-pajamas "dress." In the end, this was a pretty sad looking doll. But we had a good time cutting out the pieces of cloth. We loved searching around to find something we could use to make clothes for her. We had fun stuffing her and performing a small surgery on another stuffed animal that was old and needed a little pick-me-up. There is nothing special about this doll, but it became special because of the time we spent together. Sometimes parenting doesn’t look pretty. We dole out punishments that aren’t consistent. We give in to that tantrum. We go ahead and allow that extra piece of candy even though they didn’t finish their chores. We have kids that go out and do things that make us wonder if anything that we taught them sunk in. It can be easy to look at our weaknesses and failures as parents and see those as the sum total of our worth as parents. But these deficiencies are not what need to define us. We’re more than our mistakes, more than our bad decisions. We have the opportunity to give ourselves grace and show that to our kids. We have the chance to show our kids that it’s good to apologize for mistakes that we’ve made. We have the chance to laugh at ourselves. And that can be rather lovely. Alise is married to her best friend and is the mom to four incredible kids. She loves knitting, writing, playing keyboards in a cover band, and eating soup. She also loves making new friends and you can connect with her on Twitter, Facebook, or at her blog. Thanks so much for having me over today! Honored to be here! And thanks for choosing to ignore the laundry piles on the couch! This is great. Thanks Jessica for having Alise, and thanks Alise for reminding me that good parenting doesn’t require perfection, only time and lots of love!! Thanks! Yeah, if parenting required perfection, they would so take my kids from me. Eek! Alise, consider me a new fan! I love this post because as moms we so often forget to cut OURSELVES some slack. Absolutely true. It’s really easy to beat ourselves up. Need to remind myself of that all the time! Thanks for the comment! You know, all things considered, that doll doesn’t look that bad 🙂 I mean, I was expecting waaay worse, lol! I appreciate the reminder that we are more than the sum of our mistakes as parents. I mean, it does at least look human-ish. We think it bears a passing resemblance to the way Allie over at Hyperbole and a Half draws herself. Enough that my daughter calls it Allie now! And thanks – I think she’s a beauty too! I am dying laughing at that poor doll’s body. And this, knowing that I could never make one even half that good. Hypocrisy– fun times! Alise, your daughter is beautiful! And yeah, she’s the REAL doll in this story. Two cool peeps in one place. I like eating soup today. Jess, you are too the jealous type. We’re definitely into soup season. This makes me profoundly happy! PS, Shawn and Gus love me more. Love seeing you over here, Alise! 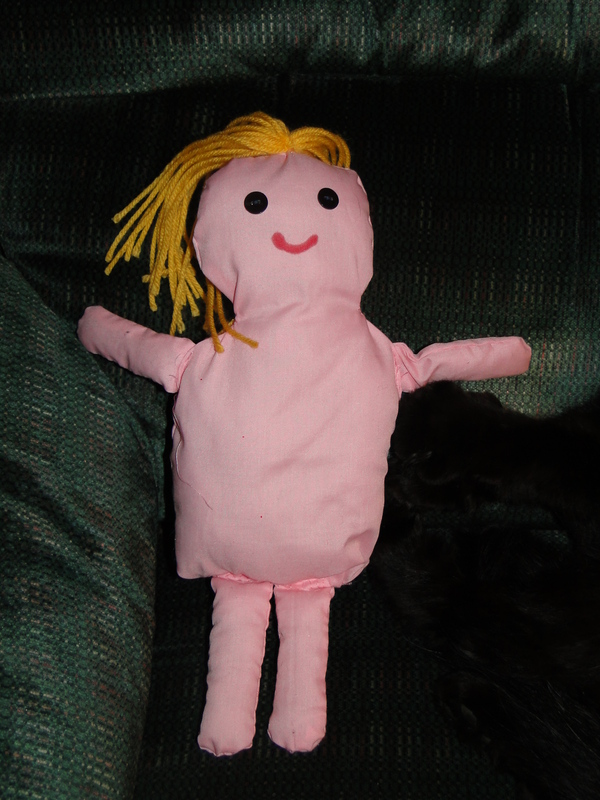 Next time your daughter requires a rag doll, I’ll hook you up. For reals. Awesome! I would love to be more domestic, but yeah. Never learned to sew, so we were just making this up as we went along. How perfectly lovely. So she isn’t an American Girl Doll, but actually, she is pretty cool. I’m guessing you made some serious memories. I started laughing at the 400 dolls remark and couldn’t stop for quite a while. 🙂 Great post! Thanks for sharing your foibles and your words of wisdom, Alise. So relate-able.